Zion Market Research has published a new report titled “Car Rental Market by Car Type (Luxury Cars, Executive Cars, Economy Cars, SUV Cars and MUV Cars) for Local Usage, Airport Transport, Outstation, and Others: Global Industry Perspective, Comprehensive Analysis, and Forecast, 2016–2022.” According to the report, the global car rental market was valued at approximately USD 58.26 billion in 2016 and is expected to reach approximately USD 124.56 billion by 2022, growing at a CAGR of around 13.55% between 2017 and 2022. Car rental is a service which provides car and automobiles on rent for short periods of time. This time period generally ranges from few hours to weeks. Car rental service is primarily located near airports, tourist places or city etc. There are many conditions on car rental service which may vary by specific country. The majority of car rental companies use a credit card to take additional fees or deposit amount before giving car on rent. Some companies request to carry identity documents while hiring car on rent. The car rental market is expected to witness significant growth due to the increasing tourism industry. The major driving factor for car rental market is growth in the international tourism which in turn supports the demand for car rental services. 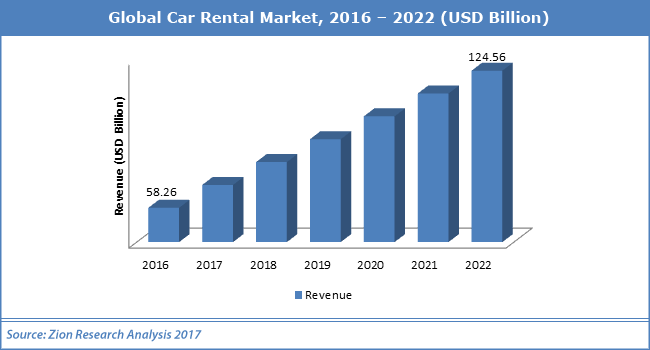 In addition, healthy economic growth and rising disposable income in developing countries are expected to have a positive impact on car rental market. The high demand of internet and smartphone that increases the convenience of car rental service is expected to develop an astounding growth of key players of this market. Affordable prices of car rental services and rising demand of car rental on daily basis need are emerging trends which are likely to open new market avenues in the near future.However, some restraints like a rise in crude oil prices may hamper the growth of this market. On the basis of car type, car rental market is divided into MUV cars, SUV cars, economy cars, executive cars, luxury cars.Economy cars accounted for approximately 33.10% share of the global market in terms of revenue in 2016 due to rising price of fuel.It is the fastest growing car type in the forecast period with CAGR around 13.73%. Local usage, airport transport, outstation and others are the different end-users of car rental service. Car rental for airport transport dominated the global market and accounted for 41% share of the overall market share in 2016.This is primarily owing to rising international business activities. North America is expected to remain the market leader over the forecast period and accounted for 44.60% share of the global market revenue in 2016. The growing use of internet and smart technology users in the region is one of the major reasons for the growth of the car rental market in North America.Rapid industrialization and tourism industry in emerging economies of Japan, China, and India are expected to drive the car rental market in Asia Pacific. Key industry participants include Avis Budget Group, Inc, Sixt Rent-A-Car, Enterprise Rent-A-Car, The Hertz Corporation, Europcar, Al-Futtaim Group, Carzonrent, Localiza Rent A Car, and Eco Rent A Car. Global 2-6-Dicarboxypyridine Market 2018 – Dow Chemical, Alfa Aesar, Tokyo Chemical Industry CO. LTD. Global Dried Cashew Nut Snack Market Insights 2019-2025: RM Curtis, Ten Wow, Jin Bai Sui, Yilin Vietnam Co. Ltd.